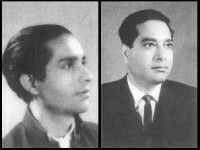 Kalim Sharafi as a young man in 1949 and 1964 respectively. le discoveries that he makes on his own. “Which village are you from in Chittagong?” Kalim Sharafi asks me in perfect Chatgayya, upon discovering my origin. He then begins a tête-à-tête with me in the language and smiles fondly to himself. “He can speak fluent Sylheti and other dialects as well,” adds Sharafi's wife, Noushaba Khatun. "When I see boys and girls working together for a cause, no matter how small the issue may be, my heart swells with pride and joy," smiles Sharafi. "For instance, several publications have been made in volumes regarding culture, politics, history, Tagore, where I have seen groups of young people working together as one. I have been honoured to offer my ideas, suggestions and be a part of such projects." To him, strength lies within oneself, to perform the most difficult task, sometimes even the impossible. In 'Kalim Sharafi's Album' written and compiled by M A Taher, Sharafi says that the course of nature requires human beings to spend a very short span of time on earth. It's up to each one of us as to how we make use of it, he says. "Life is much more than the yearning for money, properties and power," says Sharafi. "It cannot be defined as how much life has given us, but rather what we have given to the people." Sharafi is quite optimistic about the development that is taking place in the field of media and communications in the country today. The founder director of Bangladesh Television in 1964, Sharafi is one of the pioneers in introducing electronic media in the country. "I welcome changes and progressive ideas," he says. "The media has changed tremendously over the past few decades. We now have the resources to match our international counterparts. However, we seem to take these advantages for granted and misuse them to promote vulgarity and thoughts against culture. This unnecessary colouring should be stopped." Speaking on the occasion of May Day with Mamunur Rashid and Khaled Khan of Oronnok Theatre Group. Yet he is very positive about changes in the field of media such as the digitisation of music and also the advent of western influence on band music in the country. "We have to move along with time to survive," he says. "There is nothing wrong with the practice of band music in Bangladesh. In fact, the fresh sound is welcomed and appreciated. However, in the name of change, we should not lose our integrity and respect for the culture in any case. "Sharafi mentions the distortion of Tagore songs, which have been taking place in the past few years. "One can always experiment,” he says. “All you have to keep in mind is to follow the swaralipi to sing Rabindra Sangeet," he says. According to many an expert, Rabindranath Tagore's compositions have several levels of meanings. The blend of words, rhythm and melody has certain implications, which need to be pronounced and stressed in particular ways to bring out the true connotation of the lyrics. 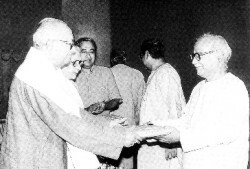 Rabindra Sangeet singer Wahidul Huq offering a token of appreciation to Kalim Sharafi. With Ustad Alauddin Khan and Artiste Zainul Abedin. In his book, Smrity Amrito, Sharafi says that upon entering prison and staying there for more than a year, he had come face to face with class distinctions. “I was probably one of the very few Muslim activists that the other political figures had heard about,” says Sharafi. “To add to it all, because I was the only Muslim prisoner there, most of the political prisoners knew of me. The deputy inspector, who was also a Muslim, was a very nice man and would often offer me food from home and look out for me. However, he disliked the fact that I used to mix with the non-Muslims and would often ask me to stay away from the other activists.” He remembers that there were other non-political prisoners with him at the time as well. 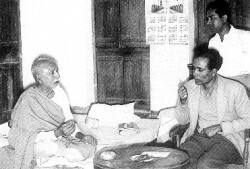 “They used to refer to me and other political prisoners as Swadeshi Babu,” says Sharafi. According to the book, the Swadeshi Babus had it easy as compared to the other prisoners. In fact, the other prisoners would do all the work for these Babus, for instance washing and cleaning. Other than that, everyone in prison had to go through absurd punishments and would spend their days thinking and planning about Swaraj. 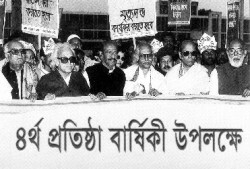 At a protest, Kalim Sharafi with poet Shamsur Rahman, Professor Kabir Chowdhury, writer Syed Shamsul Haq and others. Performing at a gathering in Chittagong in 1952. Remembering Shawkat Osman on his death anniversary at the Shahid Minar. With wife Professor Noushaba Khatun at Maryland, USA in 1981. The many awards and recognitions received by Sharafi over the last few decades. Something that has bound Noushaba and Sharafi together is their strong hold on values and culture. “It scares me to think that this country might slowly come into the clutches of the fundamentalists,” says Noushaba. Having gone through the plight of partition in 1947 as a youngster, Noushaba is not new to the political nonsense adapted by so-called leaders for the betterment of the country and its people. “I have seen the country tear up into pieces,” says Nawshaba. “Just imagine your home, where you have lived your whole life, is not your home anymore because of your faith.” She thinks about the bloody massacres that took place during the partition of India. “We had witnessed similar incidents at the end of last year during the political riots in Bangladesh,” she adds. A lot has to be traded for peace in this part of the world, she says. “I have received so much love from people all over,” says Sharafi in his book. 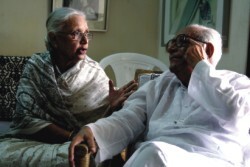 “It is this love that has kept me breathing till now.” Both Sharafi and Noushaba are full of stories from the past, wonder about the future and in awe of their present. In spite of all the grievances that they had to go through, the love for life and living still shine in their eyes.